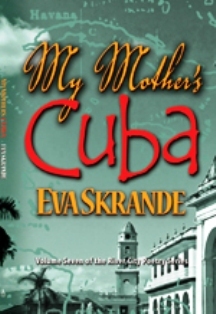 If you think of the flight of a butterfly—unpredictable, jinking and dodging, lighting for a moment then off again into the ether—you will have an apt metaphor for the movement of imagery and story and sound in the poems in Eva Skrande’s My Mother’s Cuba. Don’t look for the personal narrative or the political polemic, but expect instead the ethereal lyric, poems that pay homage to the sublime. to read the century and her seven grains. You undo my wooden heart with your mountains. that laps at my toes like the voices of brides. O lips that reign gently over fire and night. among baskets filled with the hollows of history. Many things here are mysterious: how and why sheep would “knock at the door,” what the “seven grains” of “the century” might be, how a barn might be said to drink hair, and so on. In its unexpected shifts in direction and the way it tends toward the ecstatic, this poem is a good example of the work contained in this collection, and we learn early to allay any temptation to read literally. Instead, we can marvel at the freshness and variety of metaphor that is present, and the rich catalogue of sensory detail, however dreamily employed. on the tongues of the pomegranates. over the bruised lips of a warring earth. There’s an inherent risk in a poetry that so consistently uses elaborate metaphor as the tightrope between whimsy and rapture, and it might be said that at times these poems strain the reader’s patience by employing metaphors that simply work too hard. In “The Bicycles” we have “bicycles that were excommunicated // for letting the wind blow the bibles of their virginity.” Bicycles + wind + bibles + virginity results in what for me is humor that seems out of place. And in “Seven Directions,” we encounter “the wolves exiled just east of your hair’s allegories / and the western corner of your shoulder / where birds came with their sirens to celebrate / our corn’s anniversary.” A bit tangled, that last, but for the most part Skrande reins in that impulse toward overly ornate tropes. Russ Kesler's second collection of poems, As If, is just out from Wind Publications.